I've actually tried a Cadbury Flake bar before, but I didn't review it -- I don't remember why. Nowadays I find it hard to recall a time when I ate something new and didn't write about it, so I am not sure what happened there. 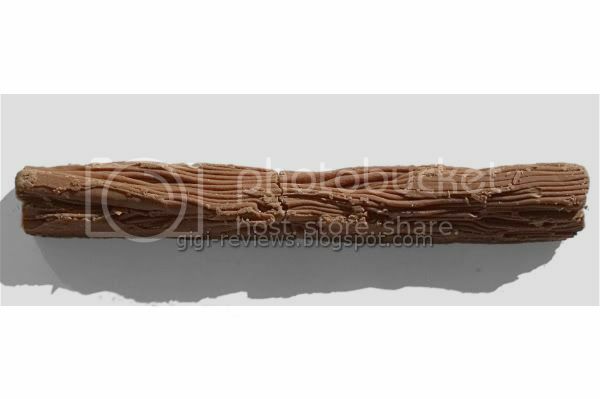 Cadbury Flake is a long bar of milk chocolate that looks sort of like a large twig. The bar is comprised of many thin layers of chocolate that has kind of curled up on itself (sort of like crayon shavings). According to Cadbury's website, Flake was invented when one of the factory workers noticed how the excess chocolate that came out of the molds folded down into flakes (gee, wonder if that's where the name comes from?). Kinda like chocolate dandruff, if you will. As best I can tell, the chocolate dandruff is then pressed together to form the bars into a sort of chocolate particle board. (Oh, how the people at Cadbury must love me right about now.) 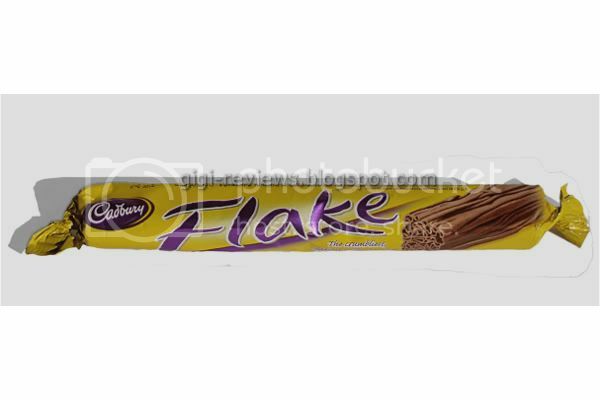 What I am not sure of is whether Flake bars are made with the "leave-ems" of other Cadbury products, or if chocolate flakes are created specifically for Flake bars. The bar has a very sugary, but only vaguely chocolate smell. In terms of flavor, it is an über-sweet milk chocolate. I also noticed more of a malty quality than I have tasted in other Cadbury chocolates, such as Dairy Milks or even the Curly Wurly. What killed it for me is that the flavor within the bar is inconsistent. Parts of it tasted nutty, other parts were weirdly peppery (this in my mind supports my Frankenchocolate theory). And the melt is on the grainy side. This bar is all about the texture. As soon as you bite into the bar, it proves true to its name. There are loose chocolate flakes everywhere. Take a lesson from me: do not eat this anywhere near a keyboard unless you really like melted chocolate on your keys -- in which case, rock on with your bad self. What chocolate does make it into your mouth splinters off into about a zillion pieces. It's like little splinters of chocolate all melting at once. I don't much like the taste, but I love the texture (minus the mess). If they ever did a version of this with some really good chocolate, it would be a dangerous thing in my world. As is...well, as I said, I really liked the texture. Be sure to check out Jim's review here. I think he liked the bar more than I did. 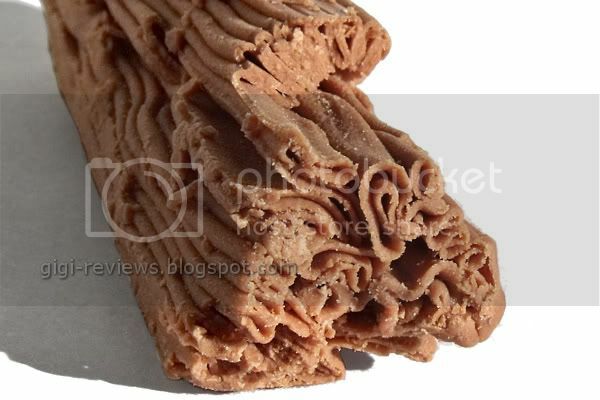 Ahhh the flake ... one of the most inconvenient chocolate bars to eat EVER. FACT!! Having been brought up on Cadbury Chocolate I get nostalgic waves of pleasure from the taste but I can see how someone who isn't used to the Cadbury taste could think it is a little average. The texture created by the crumbly nature is both the bars biggest strength and weakness. Horrible to eat but it has a lovely melt in the mouth. Being a Brit I am accustomed to Cadbury chocolate, the art is in the eating, as you have found out! If you ever chance upon them again, the trick is to keep it in the wrapper and only pull out what you intend to eat. And at then end you have all the crumbs in the bottom! Love this chocolate. You should have also reviewed Aero and Smarties. Both are very good and also available back home and made in Canada. Messy as it is I DO love the texture of this bar. How I really want to try it is with ice cream. Funny you say that. I did have a pack of Smarties lined up to be included in Brit Week- but sadly they had bloomed. I can get them locally so I will make a point of getting another bag soon. I actually reviewed the Mint Aero WAAAAAAAY back in the day. I wish they did Aero type products here, it is one of my favorites.